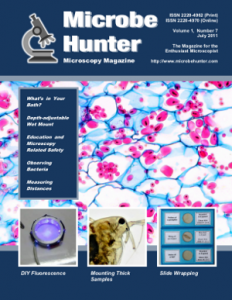 Welcome to the seventh issue of MicrobeHunter magazine. You can download the PDF and order a printed version. Shallow concrete bowls which are used by birds for drinking and bathing initially start out clear, then go green, and then red. Please do not squash me! How to prevent the coverslip from crushing the specimen. Joseph Wilhelm continues his musings and thoughts about microscopy. In this episode he focuses on education and safety. Several blue LEDs and a highlighting marker – Enough for some simple fluorescence work. Observing unstained bacteria requires a phase contrast microscope. What can you expect to see? It is possible to use the free program GIMP to do measurements on micrographs. Many antique microscope slides were wrapped in decorative paper. Here is an attempt to rediscover this art. Woot, I’m so excited! I’ve been looking forward to this issue! 😀 Thank you Oliver/Mr. Kim. Perhaps you can post those “..so many things i cannot do without difficulty” in a forum. I’m sure if someone is knowledgeable on a subject, they could possibly help you out, thus helping others out maybe. Maybe it will be a subject for an article. Who knows?